Gov. 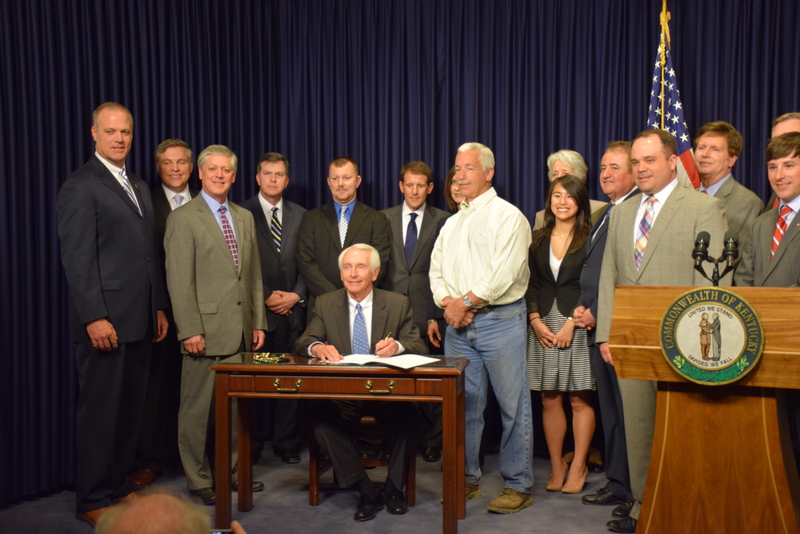 Steve Beshear stood alongside Kentucky Chamber board member and AT&T Kentucky President Hood Harris Wednesday morning as House Bill 152 was signed into law. HB 152, known as the telecommunications modernization act, provides telecom providers with the flexibility to invest in new technology and removes the mandate requiring them to spend money on out-of-date infrastructure. The legislation was passed by the Senate March 2 after passing out of the House earlier in the session. The Chamber has been a longtime supporter of the legislation, sponsored by Rep. Rick Rand. Sen. Paul Hornback has sponsored this legislation for four years and filed a companion bill, Senate Bill 3, again this year. The Chamber joined the groups critical to the bill’s passage at the signing Wednesday and thanks both Sen. Hornback and Rep. Rand for their commitment to this important business issue. “Telecommunications reform will help make our Commonwealth more attractive to businesses so we can compete for investment dollars and jobs,” Kentucky Chamber President and CEO Dave Adkisson said.